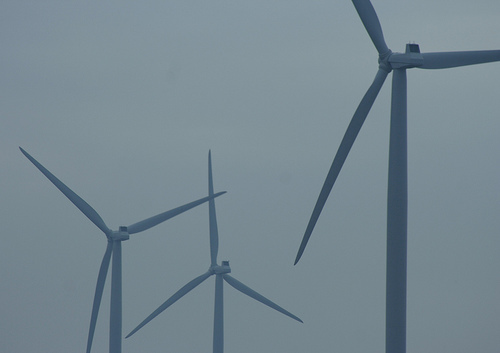 Michigan’s Thumb is tapped out when it comes to the ability to host new wind farms. The agricultural region of the state is home to two commercial-scale wind power developments, with a total of 72 turbines near Ubly and Elkton. There’s plenty of room to build additional wind farms, but not enough capacity on the transmission grid to handle the power they could generate. Which is why a company called ITC Holdings Corp. is working on a $510 million Thumb Loop Project, to construct 140 miles of 345 kilovolt lines and four new substations across the Thumb, through Tuscola, Huron, Sanilac and St. Clair counties. Think of it as a pipeline that carries renewable energy. The system, due to be in operation by 2015, will be capable of supporting up to 5,000 megawatts of capacity, or more than 2,800 additional wind turbines. Local and county officials say there’s wide support for the transmission project, which will help the state meet a renewable energy standard enacted in 2008 that requires utilities to get 10 percent of their power from renewable sources by 2015. “A lot of the development that’s going to happen in the future in Huron County is dependent on that line. There’s no question about it,” said Jeff Smith, director of the Huron County Building and Zoning Department. The Thumb Loop Project is to be constructed in stages, with the first segment on the western side of the Thumb due to begin in the spring of 2012, and be complete 2013, according to ITC. The new transmission system is to be built mostly with tubular steel monopoles, up to 150 feet high depending on location, with average spans between poles of 900 feet. The bundle of wires required to carry the electricity will be about two inches in diameter. ITC is currently working from west to east in the Thumb, on easement and right-of-way agreements with landowners, said Tom Vitez, vice president of planning for ITC in Novi, Michigan. Siting of the line has already been approved by the Michigan Public Service Commission. Property owners will receive a one-time payment from ITC for putting a pole on their land, generally based on the fair market value of one acre. The Thumb Loop Project will install a double-circuit line, which exponentially expands the amount of power than can be transmitted. The current, 120-kilovolt line is a single-circuit line, without as much capacity. The $510 million Thumb Loop Project will be funded by ratepayers across 13 states that make up MISO (formerly the Midwest Independent Transmission System Operator), Vitez said. The cost for an average residential customer is unclear, but is estimated to be about $1.10 per year, based on data from MISO. ITC owns and maintains more than 8,200 miles of high-voltage electric lines in Michigan’s Lower Peninsula, along with 236 substations. The company has targeted the Thumb for improvements in part because the region was identified in 2009 as having the highest wind potential in Michigan by a Wind Energy Resource Zone Board appointed by the Public Service Commission. Wind energy developers are already making plans to connect to the new Thumb Loop. Minneapolis-based RES Americas Inc. is developing two wind projects in the region, one called Pheasant Run and another called Deerfield, with a combined total of 200 to 250 turbines spread over 60,000 acres, according to development manager Brad Lila. Other wind projects are under development in the region by companies including Consumers Energy, DTE Energy, Exelon, Geronimo, and NextEra. A small group of residents, however, say enough turbines have already been planted in the Thumb. They don’t want to see more big blades on the landscape, and say existing turbines near Ubly and Elkton have created noise and other problems. Duda, 68, was part of a petition drive last year to stop the Deerfield project. He and about a dozen others were able to gather 350 signatures by a late-November deadline. A total of 667 were needed to put the question on a February 2012 ballot. Duda says he ran out of time, and into problems from people he claims were harassed after signing a similar petition that forced a November 2010 vote on wind projects proposed by DTE Energy and Heritage Sustainable Energy. That ballot proposal was approved, 60 percent to 40 percent. There’s also concern in the county and state about a proposal from Michigan Gov. Rick Snyder to eliminate the personal property tax on equipment like wind turbines. That would mean local governments like Huron County couldn’t collect taxes from such equipment, which bring millions of dollars into local coffers. Either way, Lila says the ITC improvements should help lower the cost of wind power in Michigan, making it more competitive with traditional sources of power like coal. Already, wind power is selling for as low as $61 per megawatt hour in Michigan, compared to $115 per megawatt hour when the first wind projects were constructed here, according to state records. The cost of power from a new, conventional coal plant in Michigan is higher, at about $133 per megawatt hour. Vitez, from ITC, agrees. The current process for building a wind farm also includes costly studies of whether the current infrastructure can handle more capacity. Jeff Kart is principal at Enviroprose, an online communications consulting business based in Bay City, Michigan, that specializes in environmental media. He spent 14 years at The Bay City Times, the last several as an environmental reporter. Correction: An earlier version of this story incorrectly stated that a November 2010 vote was on two RES projects. After twice rejecting a 780-mile transmission project to move wind energy from Kansas to the eastern United States, Missouri regulators are signaling they’re ready to approve the $2.5 billion project.